Terry: What's in Your Mouth? Dental clinicians have a responsibility to teach patients the importance of oral health care, and this book shows adult patients what can happen if they neglect their teeth. It presents full-page images to show what plaque, decay, and gingivitis look like and how they can contribute to periodontal disease and tooth loss. It also instructs the reader on the proper brushing and flossing techniques to prevent such negative outcomes. With the combination of exquisite clinical images and descriptive yet succinct text, What's in Your Mouth? 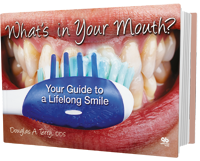 : Your Guide to a Lifelong Smile is an excellent chairside tool for patient education on oral hygiene.